During my initial search for someone to help me self-publish my young adult novel, I approached several companies. I chose Wrate’s Editing Services because unlike some of the others, Danielle got straight back to me and seemed like a proactive person, which she is. Writing a book involves baring a lot of yourself and you need a publisher who is empathetic and reliable. Danielle did exactly what she said ‘on the tin’, i.e. in her publishing guide, and the entire process was hassle-free. I really appreciated that she asked me how I wanted her to approach the editing and made sure I understood exactly what she was going to be doing. Throughout the process, the input Danielle and her team provided made me feel very supported. Danielle was excellent at returning emails and phone calls and never made me feel uncomfortable or that I was asking too much. Danielle’s marketing assistance was invaluable. My book is set in Coventry, and she was able to secure a big article in the Coventry Observer, which led to an invite for me to appear on the local BBC Radio station. Since my book was published, I’ve had so much positive feedback and I now do various school events where I read from my book and provide creative writing workshops for students. 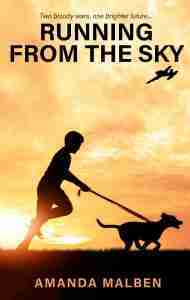 I wrote Running from the Sky to prove to myself that I could write a book – now I’m proud to call myself an author.